City slick break in Lugano! Boasting a convenient setting in the fashionable lake city of Lugano, couples and groups of 4 can enjoy a city break with a difference. Located to the 2nd floor of a modern purpose-built residence, couples and groups can enjoy a carefree ambience in which to relax and entertain. With its bright and inviting living room furnished with sleek and contemporary touches, guests can enjoy a stylish setting in which to relax and enjoy a movie, to the SAT TV with DVD player. WIFI access is also to hand, enabling guests to keep in touch with loved ones whilst away. The floor-to-ceiling glazed window invites plenty of natural light in, whilst direct access also leads outside to a sunny covered balcony terrace perfect for summertime enjoyment. A stylish dining area with kitchen for 6 complements the spacious living area. Guests can easily embrace the freedom which comes from a self-catering stay, with all the must-have appliances to hand including a cooker hob, oven microwave, toaster, kettle, coffee machine and dishwasher. The neutral and inviting interior continues onto the spacious master bedroom. Furnished with a double bed and offering direct access out to a private covered balcony, guilt-free slumbers can easily be enjoyed here. Extra guests will feel right at home too, within the comfort of the living room which features a plush modern sofa bed. The holiday apartment benefits from a spacious bathroom fitted with tub and a second full bathroom with bath tub and shower. Laundry facilities also feature within the comfort of the apartment. Guests can enjoy the luxury of a swimming pool during their stay, with a fabulous one provided onsite (shared by 20 apartments in all). Outside, public parking is within easy reach of this accessible and centrally located retreat. Situated in a convenient part of Lugano, guests can take in the wide array of city highlights on foot or by public transport. From supermarkets, food markets and delicatessens to complement a self-catering stay to charming cafes and authentic fine dining to savour, Lugano offers everything a food fan could wish for! The picturesque lakeside setting of Lugano also provides a timeless excuse to enjoy a picnic in the park, an idyllic ice cream stroll or an enjoyable boat trip; whilst the designer shopping, museums and art galleries will keep city-break enthusiasts amused. As the sun sets, the fashionable Swiss lake city comes alive; with a great selection of hip bars, buzzing nightclubs and casinos to glam up and be seen in. 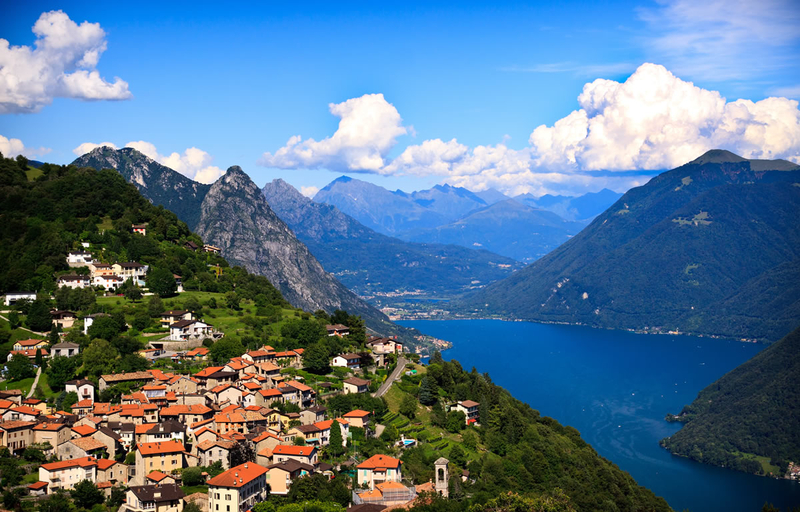 The surrounding Lugani area is home to a plethora of breathtaking hiking routes and a host of leisure pursuits that range from water sports, golf and tennis to spa days, extreme sports and family days out up at the Tamaro Water Park and on Lake Como (40-65 minutes drive away). 2 night break - 50% off weekly tariff / 3 night break - 40% off weekly tariff / 4 night break - 30% off weekly tariff / 5 night break - 20% off weekly tariff / 6 night break - 10% off weekly tariff.